This is summer on a stick. It is a great dish to start out a meal or as part of luncheon buffet. Kids and adults love snacking on this one and it’s a great way to utilize all those cherry tomatoes growing in your garden. This delicious dish is low fat, low salt, low sugar, gluten-free and vegetarian. Cut cheese in half if it is not small enough. I usually pick tomatoes and bocconcini that are the same size. On a sheet of kitchen paper, combine basil and Massel bouillon. Roll bocconcini pieces in the basil mixture. 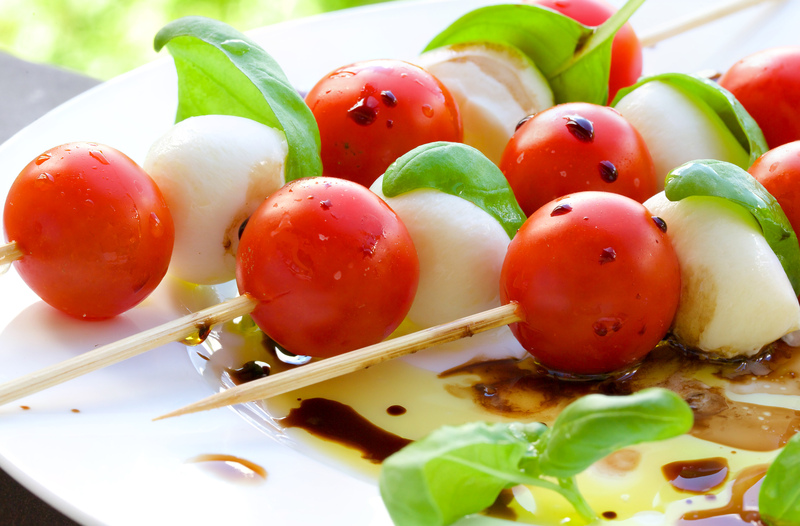 On a long tooth pick or skewer, alternately place cherry tomato and bocconcini slices down the skewer, creating a boccconcini/tomato sandwich. Serve three “tomato cheese sandwiches” on a skewer. If you want to kick up the presentation up on this easy appetizer, use rosemary twigs as your skewer. People will think you spent hours on it.